In South Africa, we can get away with Mediterranean architecture, thanks to our warm weather and beautiful views. This is why today at homify, we are going to show you a gorgeous Spanish villa that will inspire you when it comes to architecture and design. Created by design professionals Riba Massanell S.L, the home is 190 square metres of pure, authentic Mediterranean inspiration, packed with charm and personality. Let's take a look at this homely space and find out how we too can create a warm and inviting spot just like this one! The outside of the home is charming and subtle, while introducing the Spanish theme to neighbourhood. 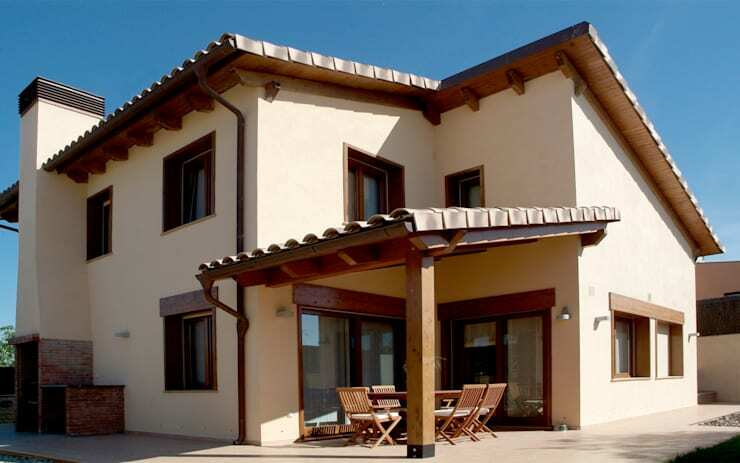 The designers have gone for a soft terracotta colour, which works beautifully with the darker tiled roof. This is a fairly large home that spreads over two storeys, which are made up of different volumes, layers and levels. This creates quite a grand and impressive effect. 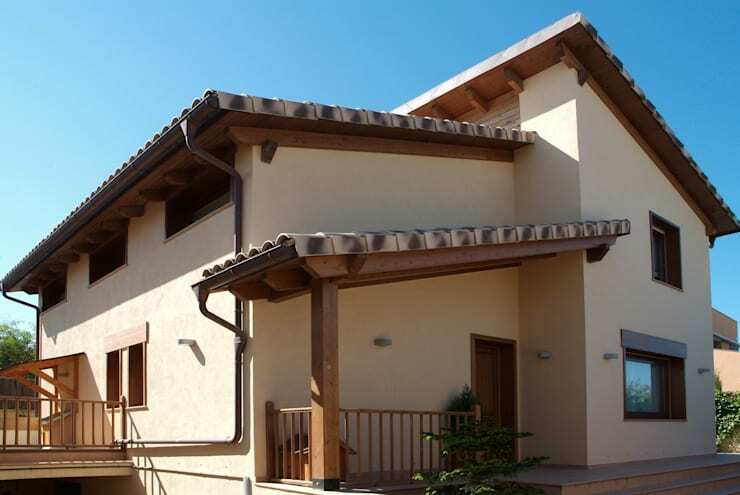 The home is finished rich wooden elements including wooden beams, wooden banisters and wooden window and door frames. 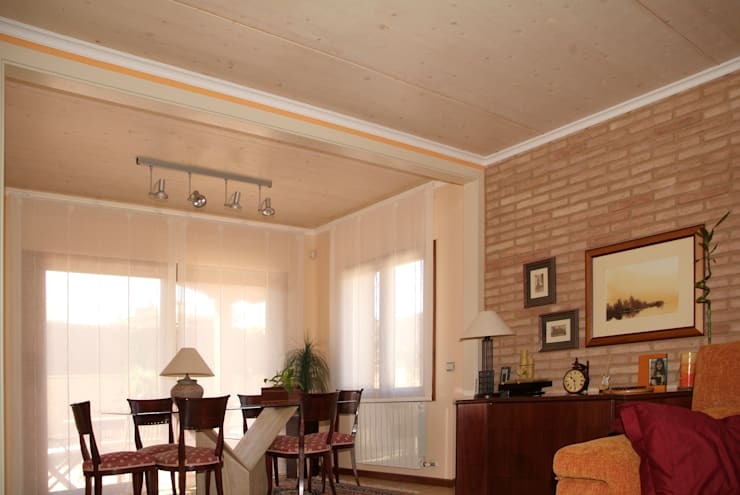 Wood is always a great finished touch on a home, adding a very comforting and inviting effect. Have a look at these: Tips on how to integrate wooden elements into your home. If we go around the side of the house, we can see that it features a cosy little terrace, sheltered by an extension of the roof. The terrace furniture is made up of a wooden table and chairs, which offer an outdoor dining area for the whole family. In South Africa, an outdoor space like this is a must, where you can enjoy the warm weather, share meals with family and friends or even host small events. The wooden chairs and table are also great for this kind of space! Remember that even if your terrace is under cover, you need to invest in furniture that is durable and will last throughout the weather conditions. If your outdoor chairs have cushions on them, pack them away when they aren't being used so that they last much longer. An entrance hall is often overlooked as a means to an end, but this shouldn't be so. Remember that your entrance hall is the first impression that people will get of your house, so you want it to stand out. Place a beautiful piece of furniture like an armchair or a chest of drawers, like the designers have done here, which will add a bit of decor and design to this space. A lamp is also always a great addition, lighting up the space with a soft glow, which makes your home look that much more appealing. 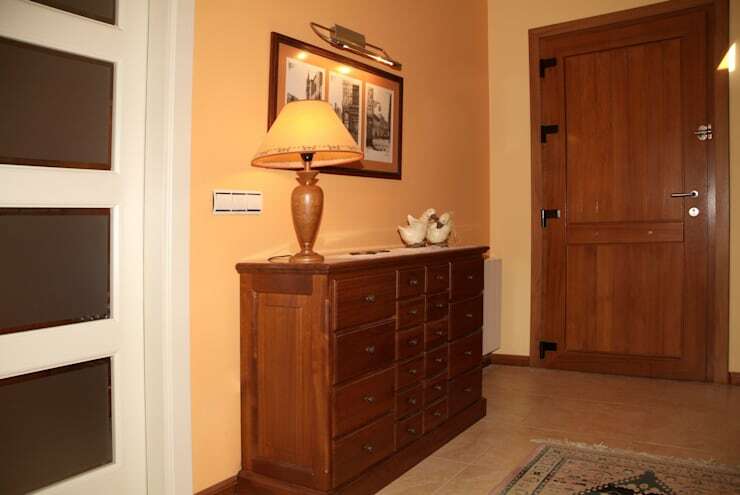 Have a look at these tips: Make a great impression with your entrance hall! If we step inside the home, we can see that it's very charming and filled with personality. The living room and dining room open up onto one another and feature very warm tones throughout. 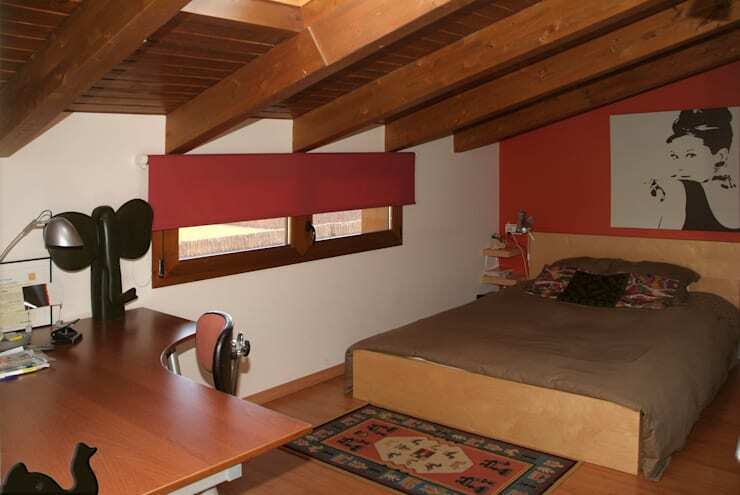 This is achieved by the dark wooden furniture, the light brown sofa and the red cushions. Warm colours are always great for an interior, as they make the space very inviting and cosy. Thanks to the windows on the one side of the room, there is also a lot of natural light in this space, which are controlled by soft, nearly transparent curtains. It's the personal touches, however, that make this space what it is. Remember that your home is an extension of who you are, so you want it to feature pictures that remind you of your best memories, your favourite artwork as well as decor items that speak to you. In this design, we can see that the residents have done exactly that! The bedroom in this home is very attractive and cosy, thanks to the warm wooden floors, wooden ceiling beams and splashes of red. It's always a great tip to go for neutral colours in a bedroom and then add a splash of colour in the form of cushions or a bright and patterned rug. Another great design tip is to paint all of the walls white, except for one, which you can paint a bright red or blue or even grey. Because of the darker colours in this space, the designers have opted for lots of natural light, including skylights and windows. This is a must if you have darker shades and tones in your bedroom. Natural light also creates a much healthier, lighter and more spacious looking room! We end off our tour looking at a little loft area, which again is just filled with personality. 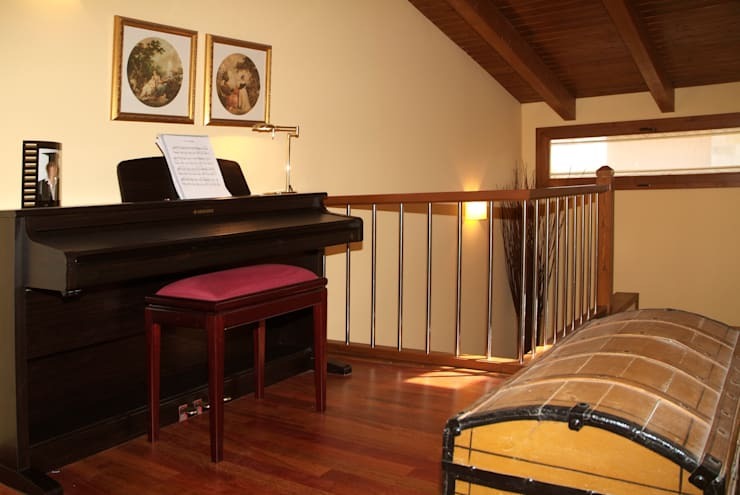 Featuring a grand piano as well as an old, antique-looking chest, this is most certainly a space where the residents of this home can spend time escaping from the rest of the world by playing music! It's so important that your home serves as a little cocoon, where you can rest and feel rejuvenated before facing the world once again. Including functional items in your home to help you do this, such as musical instruments or even a yoga studio, can also double as a form of decor. Don't you love the charm that this piano brings to the home? We can also see that the designers have added some artwork to the walls as well as a picture of the one of the children to the top of the piano. It's all about the detail! Are you tickled pink by this cosy home?